Do you know your WHY? Why do you have the joy you have? Why are you so good at it? Why do you LOVE your job so much? The answers to these questions may have more power than you think. Recently, Tony and I were talking about the reasons why we adore our job so much as we were driving back from an out of state wedding. It got us thinking about how those reasons, how our WHY, impacts our work on a day to day basis. As we start to reflect on 2017 (already?!) and the weddings we’ve shot, the couples we’ve met and photographed and developed relationships with, we’ve watched our WHY become more and more clear, and it’s been so helpful to realize our purpose for our career! In case you’ve ever wondered what we see in wedding photography, WHY we chose this path for our life, or WHY this field means so much to each of us, this is it. 01. We are wedding photographers because we believe in real, authentic love. We both believe that we’ve become different photographers throughout different seasons of life; we see love and photograph love much differently now that we’ve experienced it together. 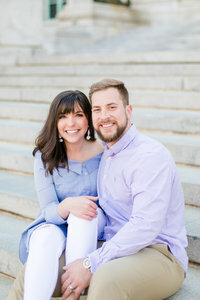 We photograph engagement sessions differently because we remember how excited (and nervous) WE were for ours. And we shoot weddings very differently now that we’ve gone through our own wedding, too! We know what moments matter more than you might expect, and it helps us serve our clients better as a result. And we’re wedding photographers because we believe LOVE is so amazing that it specifically deserves to be celebrated, especially on the first day of a couple’s FOREVER together. It’s as simple as that. 03. We’re wedding photographers because we see things differently than most. We see the butterfly-filled excitement and happy tears in the eyes of our brides as they put on their wedding dress once the wedding morning has finally arrived. We see the anticipation and sheer emotion on the faces of a couple about to see each other for the first time on their wedding day. We see those glances exchanged between a daddy and his daughter a moment before he hands her off to the love of her life. We see the way the groom watches his girl when she’s not even paying attention. We see the pure adoration in the eyes of the bride as she smiles up at the man of her dreams, who she gets to spend forever with. We see the pride and joy in the eyes of the grandparents present on a wedding day as they hold hands during the ceremony. We see the quick tears that slip down the faces of bridesmaids as they watch their best friend dance with their brand new husband. And we see the tears a mama wipes from her eyes while she watches the love of HER life dance with their beautiful daughter. We watch for these things before they even happen, and we are ready to make sure other people get to see these moments too… moments that, so often, are too fleeing on wedding days to be noticed by anyone else. 04. We are wedding photographers because we believe in the legacy of love. We know that someday, when our couples have grey hair and have lived a lifetime together, they can hold their grandkids and point to the engagement photos still framed on their wall to show them what Grandma and Grandpa looked like when they were young, planning a wedding and brand new to being in love. They can flip through their worn, leather wedding albums on their 50th anniversary and remember the day it all began. Through their photos, they can see who they were, feel the way they felt back then, remember the long since forgotten details, and be reminded of the sweet and innocent love they started out with. We’re wedding photographers because somewhere, someday, a little girl will find a bridal portrait of her great, great, grandma who she never knew, yet whom she can now have a small connection with. We do what we do because we get to create that legacy for generations after us. 05. We’re wedding photographers because it allows us to form an amazing relationship and bond with some equally amazing people. In order to be able to do our jobs well, we simply HAVE to have a strong relationship with our couples. They trust us with SO much on their wedding days, so we make it a priority to ensure that this relationship is solid and full of trust (and FUN!) long before the wedding day arrives. Because of this, we’ve gotten to become close friends with so many of our couples. We do what we do to develop real friendships and real relationships with our couples so that they can feel tangibly loved by us in this sweet season of their lives… from above and beyond service and exceptional photo delivery speed, to sweet gifts and surprises and keeping up with them long after the wedding day has come and gone. 06. We’re wedding photographers because we’ve been called to tell and retell the greatest love story there ever was: the love that God has for us as his children. It’s our hope and our prayer that the way we love and serve our clients makes them think twice. We hope we can look back on our lives one day and know that even when it was stressful, even when we were tired, and even when we were sick of being on our feet for eight hours, we loved our couples to the best of our abilities, we loved our couples’ families well, we served on wedding days in ways no one ever saw just to make sure the day ran well, and we loved the wedding guests and our couples’ bridal parties well, all because we love Jesus with everything we have, and that nothing we do matters apart from Him. The love we have for each other, for what we do and for our clients is simply a reflection of that love. We do what we do for so much more than just pretty photos. We want to encourage you guys to dig deep and figure out your OWN why for your job. Even if you aren’t where you want to be quite yet, knowing yourself and why you are in the place you are NOW can help you find the purpose and your mission exactly where you are, TODAY.